Radical Women, a long-lived feminist and human rights organization based in the United States and Australia, calls on you to immediately release Sepideh Gholian, a freelance journalist and university student who has been building solidarity actions for Haft Tappeh sugar cane workers, and Esmail Bakhshi, a leader of the sugar cane workers’ independent union. The two were detained in November 2018 after attempting to meet with officials about the workers not being paid for their labor. The unspeakable abuse they received forced them to make false “confessions,” that were broadcast on state TV, about colluding with Marxists to overthrow the Iranian government through workers’ strikes. After being released on bail in December, Bakhshi and Gholian went public in telling about the brutal interrogations and extreme torture they received, including sexual insults and threats of sexual violence against Sepideh Gholian. In retaliation for exposing the illegal actions of prison authorities, the two were re-arrested on January 20 and are still detained, in addition to Ms. Gholian’s brother, Mehdi Goholian. Supporters fear they are being subjected to even greater torture due to their defiance. 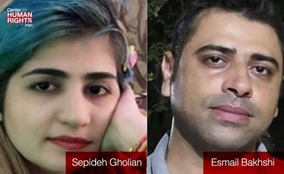 We demand the immediate, unconditional release of Gholian, Bakhshi and all other detained labor activists, feminists, ethnic minorities, civil liberties attorneys, and Leftists. We call on the Iranian government and judiciary to uphold workers’ rights, stop the arrests of dissidents, and prosecute all who violate the right of prisoners to humane treatment.